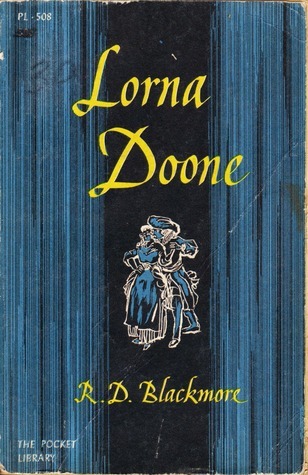 While he is fishing one day, he comes across the lovely Lorna Doone, the innocent granddaughter of the leader of the Doone clan. The two children become secret friends, and as they grow up, their love blossoms. Lorna is promised in marriage to her violent cousin, Carver Doone, but John vows to rescue her from the clutches of the Doone family. This story definitely deserves the title “epic”, since it covers a lot of ground, although the basic storyline is fairly simple. There’s some focus on the political unrest of the time and the impact it has on Exmoor, with several armies, Dukes, and papists sweeping across the country. Such a rich historical background really brings a lot of depth to the story, and provides many twists and turns to the plot. The wild countryside of Exmoor is the perfect backdrop for the mystery, suspense, violence, romance, and wildness of the story. The different terrain of the farms, the moors, the seaside, and the crags and mountains practically become their own characters, informing the reader of the mood of each scene. We get used to the comfort and safety of the fields around the farm, so that when violence comes rushing into that scenery, we are shocked and outraged. We expect to see strange and weird sights and sounds in the mysterious crags and gullies of a rocky terrain, so we are doubly interested to hear of ghostly sightings or mystifying disappearances. I felt connected with John’s character, since he is the narrator, and his personality shines through every page. But I didn’t connect with Lorna very much until the middle of the book when her character started to really flourish. There are many wonderful supporting characters, each with their own backstory and place in the plot. John’s mother, who dotes on him and spoils him and gives him his own way in everything. Sweet darling Annie, John’s sister, who apparently can do no wrong in John’s eyes. Mysterious and cynical Uncle Huckabuck, whose only goal is to acquire more money despite his already substantial fortune. Little cousin Ruth Huckabuck, misunderstood and ignored, but with a full and loving heart. Lazy John Fry, the foreman of the farm, who is only useful if you can stop him telling the most outrageous lies. The dashing Tom Faggus, an honorable highwayman, adored by all the countryside for his gallantry. And a dozen more, who becomes John’s friends or enemies, each with a life of their own, and pouncing off the page through their native dialogue, their startling actions, and close emotional pull. One thing I did NOT like about the writing style was how the narrator, John himself, talks in chronological circles sometimes. He will be telling you about this thing that happened, and then he’ll say, ‘Oh, but 3 months before that this other thing happened. And I neglected to mention that this person was a guest at the farm the whole time, so they saw it all too.’ Ugh! Why can’t you just tell things in order?!?! It was very distracting, but after the first 100 pages or so, I kind of got used to his upside-down-and-backwards storytelling style. There were also many thoughtful pages about the meaning of good and evil, and how people react to politics, and whether titled people are truly noble at heart, and how husbands and wives behave to each other, and when violence is good or whether it is always wrong, and whether or not this and that, etc… and again, I love a good philosophical thought process, but keep it to about 3 or 4 paragraphs, NOT 4 pages. It breaks up the storyline and slows down the action, and you lose your reader’s interest. I disliked how John is constantly saying that he isn’t very smart, and he doesn’t deserve the credit for some good deed, and he is just a humble farmer, and he knows that the reader won’t think much of him, just a simple man with a simple mind, and no quickness to his thoughts, and the reader must forgive him for being so feeble-minded. ON and on and on… in every chapter! OMG, John! We know you’re stupid already. Just get on with the story and stop being so darned humble! Urgh. The repetition of this one thing got on my nerves so bad! Overall though, I enjoyed this story immensely! The entanglement of the plot, the rich scenery, the irresistible characters, and the exciting mystery kept me interested and delighted with each chapter.